_ _ In the 20th century the avocado has been hailed as one of many “superfoods.” They get less super as they’ve been sitting in your fridge for over a week and you have to pick around the brown spots… When in need of a recipe to use up that borderline disgusting produce you’ve allowed to go bad, this is a perfect solution! You can use it as a salad dressing, or a sandwich spread– but either way, get some vegetables in you, you disgusting Americans. Even if you do pair it with excessive bacon… like this disgusting American. 1. 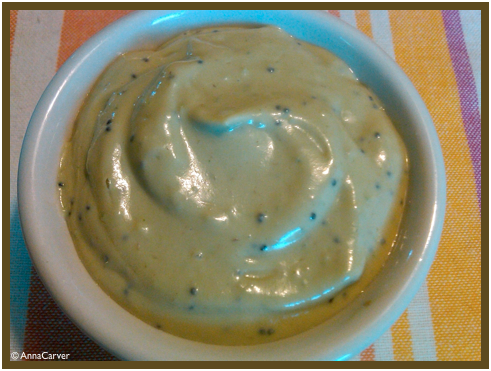 Combine all the ingredients except the olive oil and poppy seeds in a blender and mix until combined and smooth. 2. At this point the dressing will be quite thick- if you want to keep it that way, don’t add the olive oil, other wise add the oil one tablespoon at a time until the dressing is a consistency that you like. 3. Stir in the poppy seeds by hand.